Asian Cultural Council is celebrating it's 50th Anniversary this year. In anticipation of this milestone, ACC hired Vixjo Design, Inc. to rebrand the organization and design a new website. We worked with Jardins and Jardine Consulting Group to develop the new identity and branding, and Matthew Hensrud to develop the website. 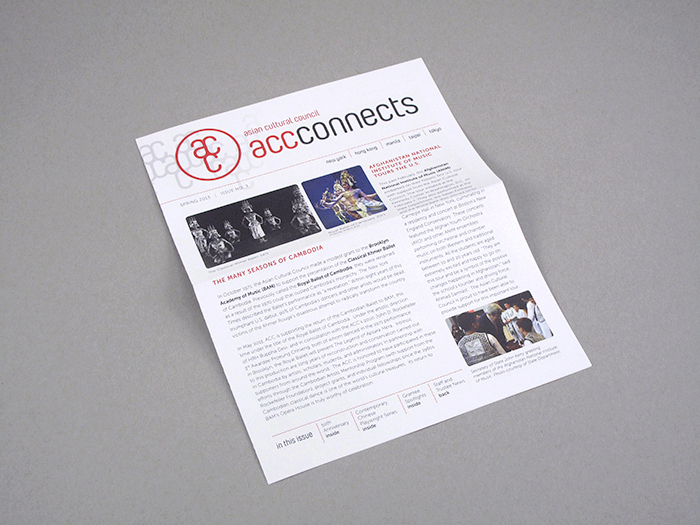 ACC has been a client since 2012 and we regularly design new publications, newsletters, invitations, and reports for the organization. 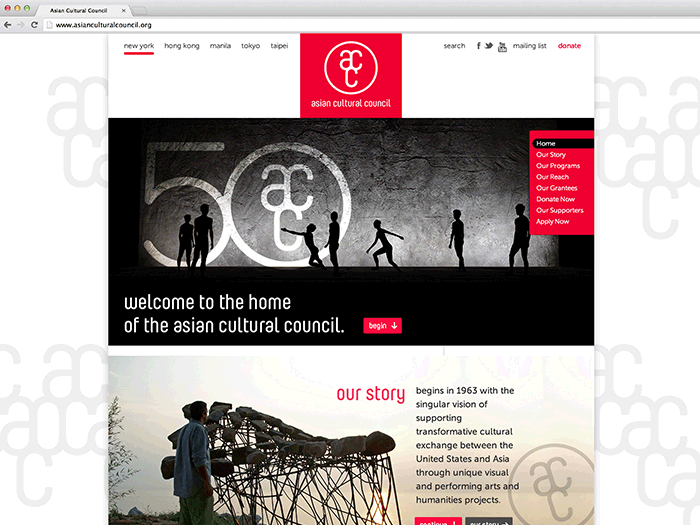 We developed a new identity and brand design for the Asian Cultural Council which included a 50th Anniversary identity to be used throughout 2013, their anniversary year. The inspiration for the design was the ancient tradition in Asia for creating family and artist seals that were used as stamps to identify their work. In this way, the acc seal appears as a graphic stamp throughout their branded materials, and is featured prominently, often bleeding off the page and rotated. The letters, overlapping and connected to be reminiscent of asian character sets, are set in the typeface Yummo, designed by young Japanese type designer Ryoichi Tsunekawa. The brand is used by all five acc offices around the world: New York (HQ), Hong Kong, Manila, Taipei, and Tokyo. 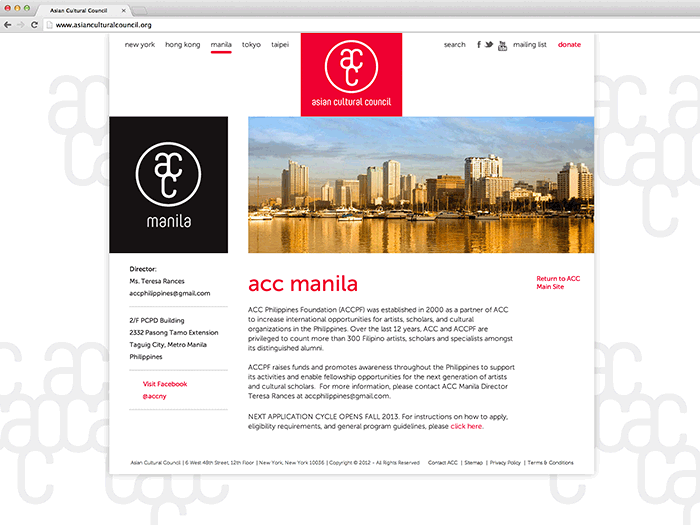 We designed a new website to coincide with the launch of ACC's new brand. 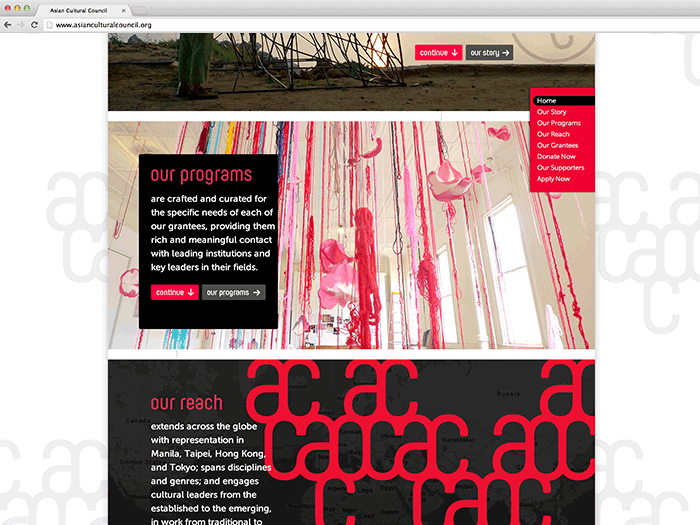 The brand graphics of the ACC stamp and the "connected acc" graphic are used throughout the site. 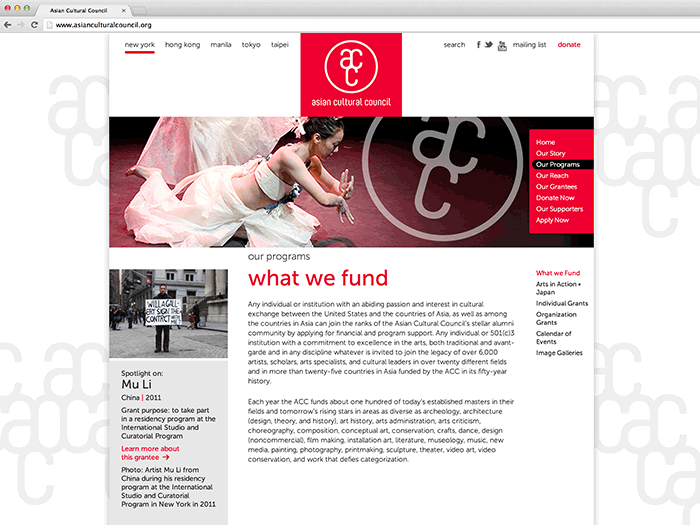 The "connected acc" graphic, shown here as a repeating background image, is used to highlight acc's role as a connector of people, ideas, cultures, and the arts. 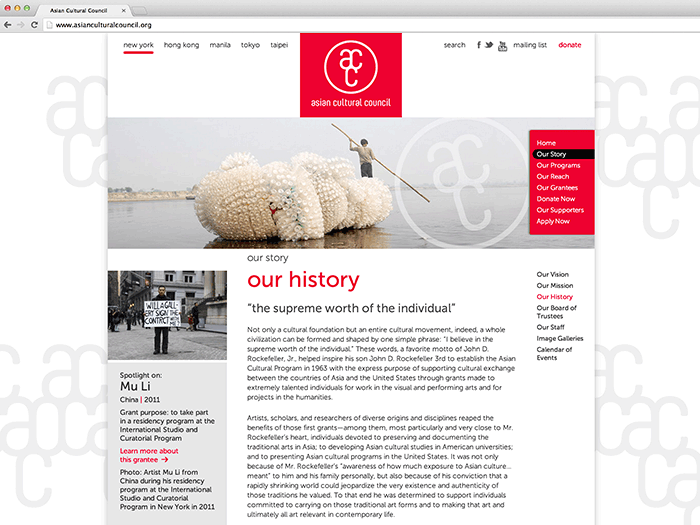 The homepage is designed as a long scroll with panels that introduce each section of the site, and tell the overall story of ACC. A series of "continue" buttons scroll users down to the next panel on the homepage, or a second button takes users into the site to explore more within that section. The site was developed by Matthew Hensrud.